Find Pam's Pashminas Scarves at local shops! Artisans Way is a fine art and contemporary craft gallery located in historic Concord center. 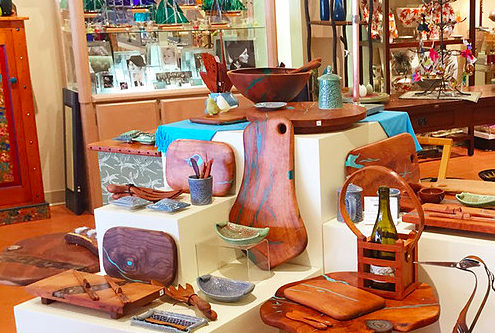 Artisans Way offers a wide variety of artisan-made ceramics, glass, jewelry, metal, wood, apparel, fine art, home furnishings and Pam's wonderful scarves. The Nehalem Beehive is an all-age venue featuring self-serve herbal teas and coffee, art and old world crafts, artisan gifts, music and the courtyard. Find Pam's fantastic Bamboo Scarves here! Oropa is a socially conscious gift shop/cafe/kombucha bar that focuses on hand-crafted/eco-friendly gifts with social value. They offer products that help uplift the environment, empower artisans, and inspire miracles. Find Pam's beautiful scarves here! The Drawing Room is the perfect art gallery to visit in Marion. Stop by and start exploring or considering joining Anthi at one of her many special events she hosts throughout the year! This gallery might be housing your next piece of art, the right fabric or tile, or the most comfortable piece of upholstered furniture! We’re so honored to be a part of Anthi’s vision in the Drawing Room and are excited to announce that she will be moving in 2019 to a wonderful new location! David Josef for Pam's Pashminas is an exclusive collection designed and created in Boston by Pam Kubbins and David Josef. This collection is a collaboration between Pam and David, who work together to discover fabrics and designs that are perfect for any occasion, person, shape or size. David and Pam (DJ & PK as they affectionately refer to one and other) met in 2010 on a day that will live in infamy. On a lark, David was asked by a friend to show some of his beautiful scarves at a small private show that Pam had been doing for years at the Westin Hotel. Pam sensed some competition and went over to David’s table of scarves and fell in love…with David and his gorgeous fabrics! He fell in love with Pam too for the same reasons and they have been friends and collaborators ever since. Their unique and beautiful creations range from black-tie evening wraps to light silk and cotton scarves and custom-made jackets. David and Pam both value making clothing and accessories for women of all shapes and sizes, and believe in a person's beauty both inside and out. Making a woman feel confident and happy in their new piece is paramount, and the key to their success. You can now find David’s scarves under our Shop collection in DPJK Scarves!